Launched by Absolut® vodka, MakerFest is a new Canadian campaign that aims to connect with and inspire the next generation of Absolut enthusiasts through the shared language of art and contemporary culture. 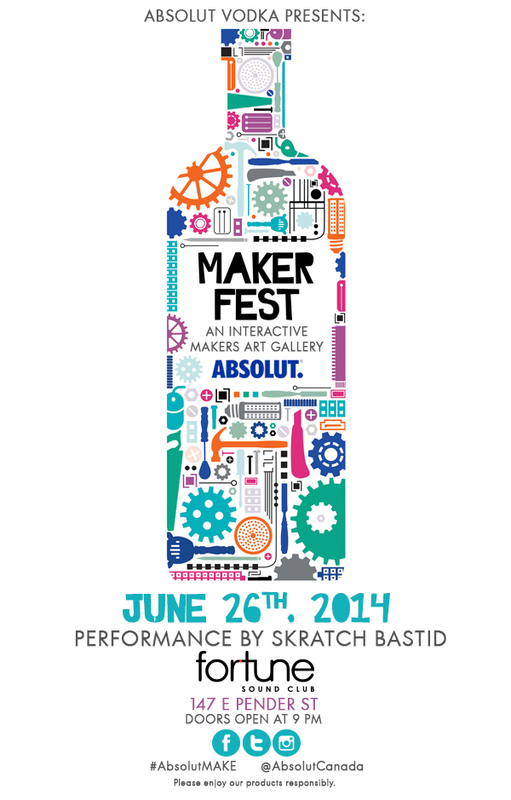 MakerFest is a new program created around Absolut’s support of Canada’s emerging maker community. “Makers” belong to a cultural movement made up of artists, inventors, tinkerers and entrepreneurs and combine traditional activities such as metalworking, woodworking and craft with technology-driven creativity, including 3D printing, device hacking, electronics and robotics. The Absolut Maker Construction Set is travelling the country, visiting the urban centres from coast to coast as part of an experiential campaign that includes regional bottle-hack challenges, bar bot competitions and a central showcase event. Bottle Hack challenge: To highlight the work of the maker community at large, Absolut is challenging makers to hack its cocktails by creating the ultimate Absolut dispenser. Creations will be showcased at Maker Fest exhibits across Canada. “Bar bot” contest: Select makers will be challenged to team up and construct bar bots – drink dispensing robots that mix and pour cocktails featuring Absolut Vodka. Gallery-style spaces will be created nationwide to showcase the inspiring works. Maker pieces from outside the Absolut partnership will also be on display at the exhibits, giving further opportunity to promote the community’s creations. MakerFest Event : A culminating event held late summer will be the ultimate celebration of world-class inventions, creations and mind-blowing works of art built by Canadian makers. The finale will showcase work from makers across the country, feature a chart-topping DJ and custom Absolut cocktails.